I mentioned a couple of weeks ago that my car is getting GREAT gas mileage now. I drive a decent amount, so this definitely matters so that I can save money. Between driving to work, then to class right after, I drive around 60 miles a day. Yes I know this isn't a whole ton when compared to others, but it adds up quickly and is a lot for me. I used to drive a lot more and because of that I have around 80,000 miles on my car that I bought brand new exactly 4 years ago. Obviously I'm in a math mood because I just calculated how much money I've spent on gas since I've bought my car. My car gets an estimated 23 miles city and 27 miles highway (I believe this is correct). This brings me to around 3,200 gallons and around $8,000. AH that's such a scary number! And that's just me, not even the BF's gas usage counted in so it's most likely around $16K. 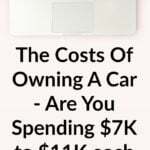 Do you know how much you've spent? We have a Jeep and my car. We don't drive the truck so I won't be factoring that into this. 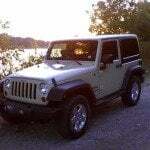 The Jeep gets 17 miles per gallon at best. I'm guessing it most like got around 13 miles to the gallon when we first got it but we switched a lot of things. My car is supposed to get 27 highway according to car reviews, but recently we switched a lot of things (they were all minor for the most part) and we changed driving habits among other things. Somehow miraculously my car is getting around 37 miles per gallon. I didn't even notice how much better it was until I realized that I hadn't filled up my gas tank in 2 weeks. My car has a lot of miles, so we started doing little things to maintain it. Whenever a part such as the filter needed to be changed, we replaced it with a performance part. Instead of getting a cheap $20 filter, we bought a $70 filter (it even came with a lifetime warranty so we never have to replace it again). My car drives so much nicer and smoothly. We keep our cars in shape. I always get my oil changed when I need it (every 5,000 miles). Of course I occasionally go over that, but for the most part I do this on time. The same goes for transmission flushes, changing the filters and so on. My tires are always properly inflated. This helps a lot. And also do whatever maintenance is needed! We combine our trips. This always saves me time. I used to just drive around aimlessly and never really think about where I was going. This resulted in a lot of my driving back and forth. Of course this saves gas! Accelerating and braking suddenly can greatly decrease your miles per gallon. Whenever the BF drives my car, he likes to do this (I have a “sports' car), and I always notice that my gas goes WAY down when he's done. I use cruise control as often as I can. I don't mainly do this to save gas, I mainly do this because it's easier to drive like this. And I also HATE when people constantly switch their speed and go from 40mph to 70mph on the highway. Super annoying. I cleaned out my car. My trunk and back seat were FULL of trash, clothes and I don't know what. It's now completely cleaned out. I also try to stay right at the speed limit. I don't always do this, but I do try. How do you choose to save on gas? A better car, changing your driving habits?